Congratulations to Chris Barton on winning the Illinois School Library Media Association‘s Monarch Award for Shark vs. Train. The award is determined by a vote among elementary school students, so it’s especially gratifying to know that our audience loves the book. 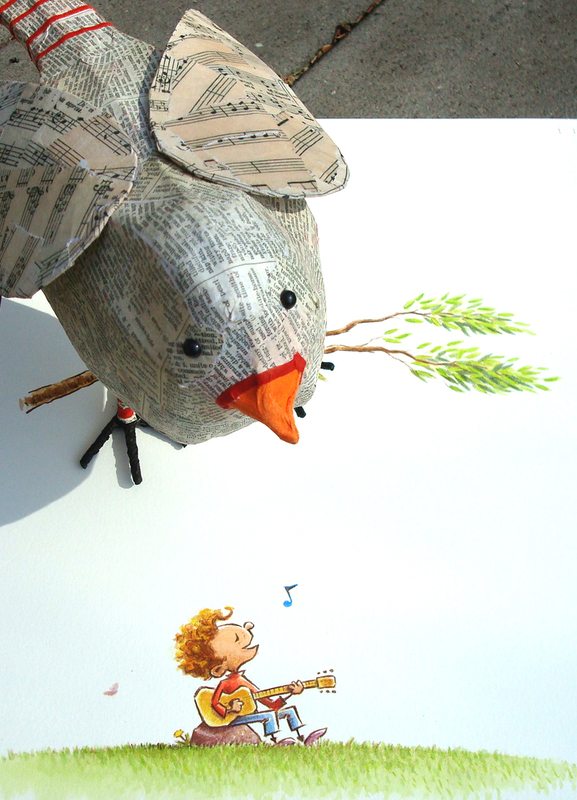 It’s always a big day when I finish the illustrations for a new book ship them off to publisher. To celebrate the completion of the most recent one – about a boy who teaches a baby bird to sing – my wife gave me a musically-adorned bird. As I write this, the studio windows are open for the first time this year and the birds are singing up a storm, so everyone seems to be celebrating. Thanks to my wife for the birdie and her everlasting patience, and to Christy Ottaviano for bringing this wonderful project to me. 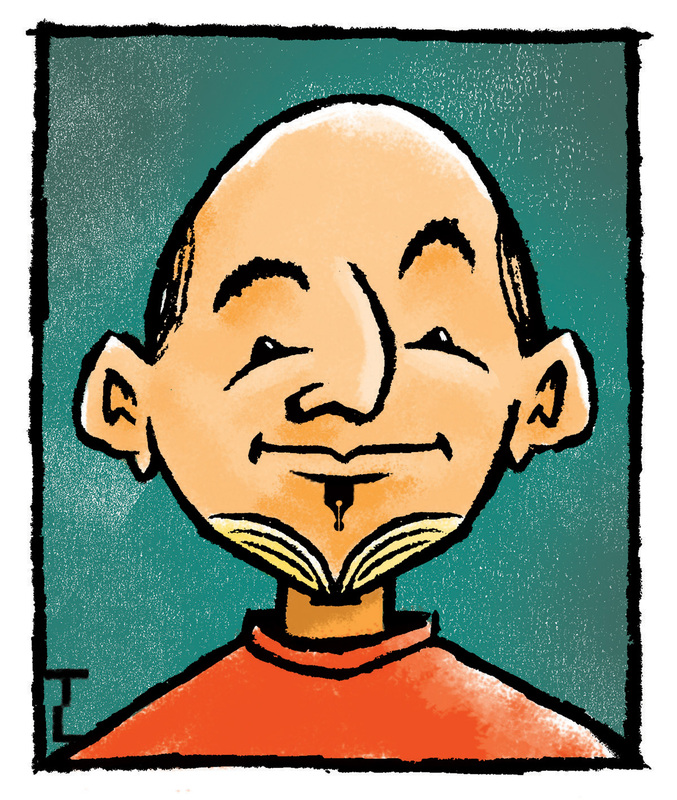 My submission to Jon Scieszka’s facebook profile photo contest. 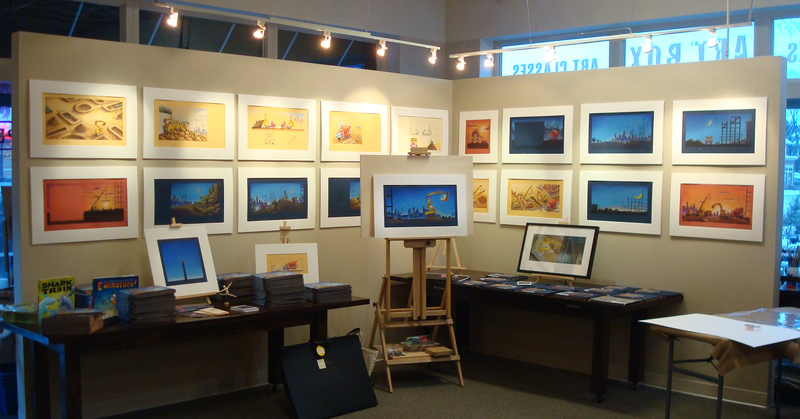 Original art on display at The Art Box in Geneva, where we had a celebration party on Friday night. This is the first time I’ve exhibited my book art and it proves that everything looks better when professionally matted and put under flattering light. Stop by if you’re in the neighborhood.